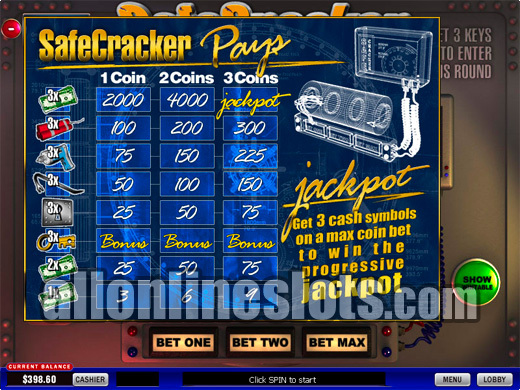 Safe Cracker is a Playtech progressive slot with a pick a box bonus. It's a three reel, single line game with a max bet of three coins and a variety of coin sizes. Three key symbols on the pay line activate the safe cash box bonus. 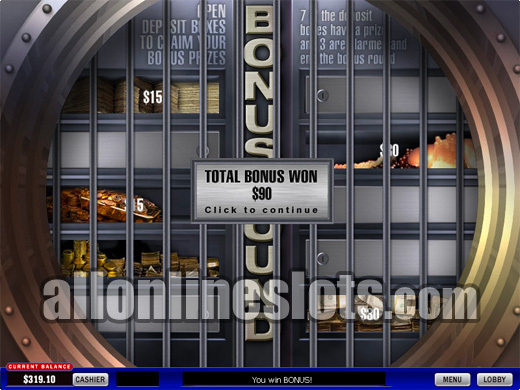 Safe Cracker is a fantastic example of why slots online can be so fun to play. Instead of going with the usual reels and background, Safe Cracker transforms your slot machine into a safe. The reels hold the combination to the riches inside the safe. You spin the reel to try to crack the combination and unlock these riches. First the basics. 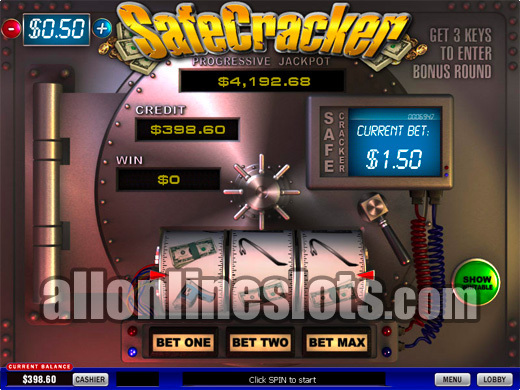 Safe Cracker is a single pay line, three reel slot with a progressive jackpot. It comes in four coin sizes from $0.25 to $5. Max bet on all coin sizes is three coins per spin. As with most progressive max bet is required to win the jackpot and we highly recommend that you take our advice and play max coins. Apart from the big progressive jackpot, Safe Cracker also offers you another way to increase your winnings. The second screen feature on this slot is an interesting one, while you can get some serious winnings you can also leave the bonus round with nothing. Hit three keys on the pay line and the safe wheel spins and opens the safe. Inside the safe are 10 cash boxes. Seven of these boxes hold prizes of additional coins and three contain nothing. You get to choose boxes until you select a box with nothing in it which ends the bonus round. 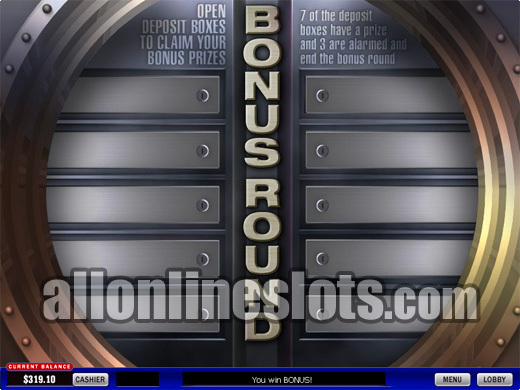 Overall this is one of the most unique progressive bonus feature slots available online today. It is well worth checking out. For smaller budgets the $0.25 machine is a great and for the larger bettor the $5 coins size is ideal.